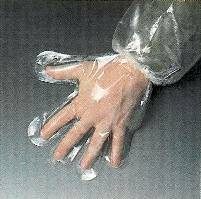 Made of transparent multi-layer plastic sheets. 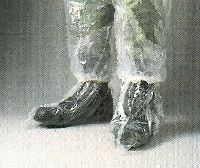 Consists of a two piece protective suit, comprising a blouse and trousers. The blouse has a cut-out contoured hood, which fits any mask, and a quick-fastener for easy closing. The garment is light and permits a freedom of movement. Combines to give excellent barrier properties as well as good mechanical strength. 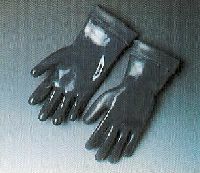 The heat seal is made by high frequency welding. It is continuous without omissions and free of incidental defects. Tests conducted by the Biological Institute of Israel to International Standards (MIL/STD/282 [method 204.1.2] to withstand mustard gas for 6 hours. 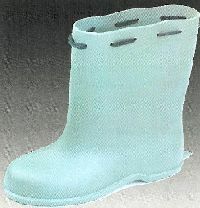 The garment is made from 3 transferred layers of polyethylene, polyamede, and polyethylene to a thickness of 100-130 microns. Tests to American Standards ASTM/D573, ASTM/D1922 and ASTM/D882 for endurance (stretching, tearing and wear). DIMENSIONS: 20cm x 20cm x 20cm. WEIGHT: 500 grams. Easily fits into briefcase or handbag.